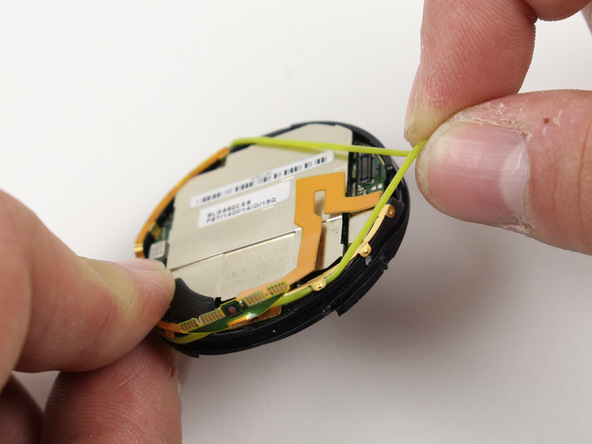 Use this step-by-step repair guide to help you replace the SNN5951A battery in your Motorola Moto 360. Use a heat gun or hair dryer (takes much longer) to heat up and loosen the adhesive holding the rear cover to the rear housing. Be sure to keep the heat gun/hair dryer about 6 inches from the device and keep it moving to prevent any possible damage caused by overheating. The rear cover is very fragile, take care to be delicate when using the opening tools. Work your way around the entire rear cover. Note: It may take several attempts of reheating the adhesive to loosen the rear cover enough to pull off. Once the adhesive has been loosened you should be able to gently pull & remove the rear cover. Locate the spring-loaded pin that attaches the wrist strap to the watch. There is a tiny groove on the end of the pin (this is where you will place the tweezers). Use the tweezers to compress the spring-loaded pin so the strap can be removed. IMPORTANT PLEASE NOTE: Take care not to lose the spring-loaded pin when removing the strap. Pull the wristband away from the watch face. To get to the O-Ring, use the plastic opening tools (or another available blunt tool) to gently pry off the rear housing. IMPORTANT PLEASE NOTE: The O-Ring and ribbon cable are delicate and easily damaged/severed. Use care when removing parts in these few steps. Once open, pinch the green O-Ring to slide it off the watch. Next, detach the copper ribbon cable that connects the motherboard and display. When you reassemble place the ribbon cable where indicated below and remember the placement of the ribbon. Use a plastic opening tool to separate the battery casing from the rear housing. Lift the black plastic pull-tab on the battery and pull back until the battery is removed from the casing. There are two strips of adhesive securing the battery. You may have to use a plastic opening tool to loosen the adhesive. Once the battery is removed from the back of the casing, disconnect the red and black wire. (pictured below) and follow these steps in reverse to reassemble your Moto 360 smartwatch.